Pudding rock and tafoni resist the sea, but their strength all to quickly erodes. Sandstone like sand castles soon melt under the waves, but land’s retreat is never uniform and here makes a point, called Lobos. Spanish explorers called the place Lobos Marinos, for barking seals, not wolves. In ‘33 Al Allan saved it from becoming a subdivision. Now, it is a park. It is a magical preserve, where wind, wave and rock all meet, struggle, subside and meet again. Aquatic wildlife abounds. We saw whales spouting out at sea and porpoises leaping among the waves. Sea lions and Harbor seals climbed up onto rocks to bask on this perfectly sunny day and a raft of sea otters floated lazily among the kelp. There were birds too, birds galore. New to us was the Pigeon Guillemot, a mainly black bird, with white wing chevrons and day glow orange feet and bill. It lives out at sea and only comes in to nest. 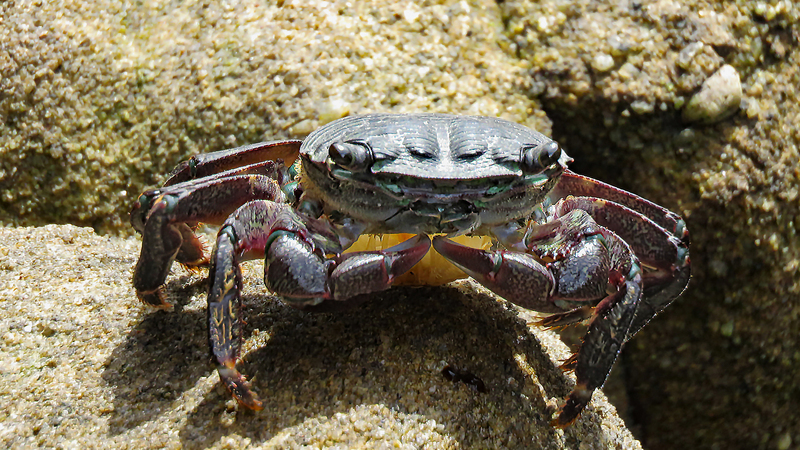 Among the other phylum, we saw while tide-pooling starfish and this bold crab that did not back down at my approach and mollusks, lots of mollusks. There was a small 1″ wingspan white butterfly, with orange stripping that Anne dubbed the Coast Guard butterfly. That was before a Coast Guard helicopter swooped down upon us, looking for wayward souls lost at sea. Unimpressed, it flew on. It was too early, because a minute later an errant wave splashed us good. It is always the unseen wave that gets you. We scurried back to the car to layout all of our things to dry. I got water in my ear, but otherwise no worse for wear. It was a very good day! Coast Guard, they do good work!